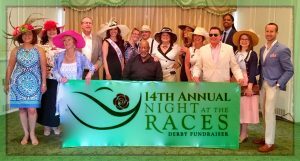 is set to host their 14th Annual Night at the Races Derby-Themed fundraiser on May 4th at Edgewood Country Club beginning at 5:30 p.m. The best Derby Party around. Benefits the Roark-Sullivan Lifeway Center. Watch the Kentucky Derby on a big screen. Delicious food, Spirited drinks, Fun games, Great music, Band dancing, Tie & Hat contests and more. Local favorites Landau Eugene Murphy, Jr, Bob Thompson, The Carpenter Ants and Miss WV will be on hand. There will be plenty of auction items as well, both silent and live. You really do not want to miss this. So fellas grab a tie and ladies find a fun hat, and join us the the fun! Get your tickets or table sponsorship today.